While the Blue Train lives up to its five-star reputation in every sense, its cuisine surpasses even the highest expectations. Dinner will be the most unforgettable experience of your adventure. And indeed, there’s a menu for every taste. Whether you require Kosher or Halaal meals, or gluten-free vegan options, simply make your needs known at the time of reserving your passage. You’ll also need to reserve your ideal dinner sitting. Our very elegant Dining Car comfortably accommodates 42 guests in a single sitting and, in the event of having more guests on the train, meals are served in two sittings to ensure all our guests experience utter luxury and decadence. Day 1 16:00 Guests arrive at The Blue Train’s VIP Lounge – Pretoria Station. 17:30 Welcome and safety briefing speeches are made – Train Manager. 17:45 Boarding commences and Butlers will usher the guests to The Blue Train. This will provide guests with an ideal photo opportunity. 18:00 The Blue Train departs Pretoria Station for an exclusive panoramic Circular tour around Pretoria. Guests will gather in any one of our exquisite lounges for some leisure time or relaxation and to enjoy aperitifs. 23:30 The Blue Train arrives back at Pretoria Station. 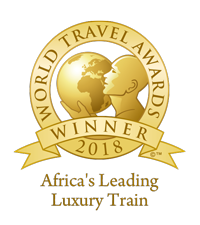 Welcome aboard The Blue Train an unforgettable experience is about to begin. Day 1 16:00 Guests arrive at the Blue Train VIP lounge – Pretoria Station. 17:00 Welcome, speeches and / or presentations are made (where necessary). Thereafter, safety briefings and announcements will be made by the Train Manager. 17:30 Boarding commences. Butlers will usher guests to their suites. 18:00 The Blue Train departs Pretoria Station for an overnight trip to nowhere. lounges and are also welcome to refresh themselves prior to dinner. 19:00 – 23:00 Dinner is served in the Dining Car (two dinner sittings). DAY 2 06:30 – 09:30 Breakfast is served in the dining Car on a first-come-first served basis. 10:00 The Blue Train arrives at Pretoria Station and guests disembark. Take a journey on The Blue Train to South Africa’s iconic resort! There is always plenty of fun to be had at Sun City. This iconic resort has been offering visitors a myriad of activities and experiences since 1979. Participate in exciting leisure activities such as a visit to Palace of the Lost City, a game drive at Pilanesberg Game Reserve or spa treatments. If you looking to pump your adrenalin, take on the world’s fastest zipslide, from your perch at 280m, you will reach speeds of up to 120km/h- even hard-core adrenalin addicts are bound to be thrilled! Wind down your day and tickle your taste buds. Day 1 07:00 Guests arrive at the Blue Train VIP lounge – Pretoria Station. 07:30 Welcome, speeches and / or presentations (where necessary). 07:45 Boarding commences. Butlers will usher guests to their suites. 08:00 The train departs from Pretoria to Sun City. 09:00 – 12:30 Brunch is served in the Dining Car. 14:00 The Blue Train arrives at Sun City Halt, guests disembark and are transferred to Sun City for the day’s activities. Guests will spend the day off the train at their own leisure. Guests can participate in exciting leisure activities such as a visit to Sun City Resort and Palace of the Lost City, a game drive at Pilanesberg Game Reserve or spa treatments. 17:00 Guests are transferred back to Sun City Halt to board The Blue Train. 18:00 The Blue Train departs from Sun City to Pretoria Station. Guests will travel in the same suites that they were booked. 19:00 – 23:00 Dinner will be served in the Dining Car. The Nelson Mandela Capture Site is a cultural and historical exhibition that is situated at the site at which Nelson Mandela was apprehended for his anti-Apartheid activism acts in August 1952. The monument in honour of Nelson Mandela and his efforts is a dramatic representation of the multi-faceted influences and the nature of a single human being that had an enormous effect on the identity of a nation. It was created by Marco Cianfanelli and Jeremy Rose, who collaborated on this magnificent project. The sculpture at the Nelson Mandela Capture Site comprises 50 steel columns that are between six and 9.5 metres in height and cover a width of almost 30 metres. These have been cut by laser to form an image of the former president when viewed at the correct angle. The columns line up so that, at a specific angle, they create what seems to be a two-dimensional image of Mr Mandela. So dramatic is the effect that it can be seen from 30 metres away. This monument is situated at the end of a winding path, which represents the long walk to freedom that he took towards his goal of political equality. As the sun changes its position above the monument, the effect of the tall beams on the ground also changes. This is the largest artwork using this methodology of laser-cut metal beams in the country. Day 1 14:00 Guests arrive at the Blue Train VIP lounge – Pretoria Station. 15:30 Welcome, speeches and / or presentations (where necessary). 15:45 Boarding commences. Butlers will usher guests to their suites. 16:00 The Blue Train departs from Pretoria to KZN Midlands. DAY 2 06:30 – 08:30 Breakfast is served in the dining Car on a first-come-first served basis. 09:00 The Blue Train arrives at Lion’s River station and guests disembark. 09:30 Guests are transferred by shuttle to Howick. 10:00 The Blue Train arrives at Howick for an off-the-train excursion at the Mandela Capture Site. 15:00 Guests are transferred back to Lion’s River Station to board The Blue Train. 16:00 The Blue Train departs from Lion’s River Station to Pretoria. Guests will enjoy pre-dinner drinks served at any one of our exquisite lounges and are also welcome to refresh themselves prior to dinner. 18:00 – 22:00 Dinner is served in the Dining Car. Guests enjoy post-dinner drinks, Cognacs and Cuban Cigars before retiring to bed. DAY 3 06:30 – 09:30 Breakfast is served in the Dining Car on a first-come-first-serve basis. An Extraordinary African Experience awaits you at Camp Jabulani! Activities include elephant encounters, meet Jessica the Hippo and game drives. Visitors have the opportunity to meet the elephants as well as view them in close proximity, learning more about their behaviour, their unique character traits, their incredible story, and what is takes to take care of a herd of this size. Much of this will take place while the elephants are in their natural environment, foraging in the bush, walking through the reserve or swimming in the waterhole. Photographic opportunities in close proximity of the elephants are also afforded. Daily elephant interactions; Game drives in the Big Five private Kapama Game Reserve; Visits to the Centre; Indulgent treatments in the outdoor Spa and Hot air balloon excursions over the reserve. 16:00 The Blue Train departs from Pretoria Station to Hoedspruit. 10:00 The Blue Train arrives at Hoedspruit Station and guests disembark. Guests are transferred by shuttle to Camp Jabulani. Guests will spend the afternoon off the train & participate in An Extraordinary African Experience at Camp Jabulani, activities include elephant encounters and game drives. 10:30 The Blue Train arrives at Camp Jabulani Elephant Interaction for an off-the-train excursion. 16:00 Guests are transferred back to Hoedspruit Station to board The Blue Train. When life throws you a little over the edge, take an adventure and abseil down the second tallest waterfall in South Africa. The Howick waterfall fall is 95m high and the cliffs are dolorite. The Falls are on the Umgeni River and flow down from Midmar Dam, through the village of Howick. Day 1 13:00 Guests arrive at the Blue Train VIP lounge – Pretoria Station. 14:00 Safety briefing and announcements are made – Train Manager. 14:30 Boarding commences. Butlers will usher guests to their suites. 15:00 The Blue Train departs from Pretoria Station to Durban. 10:00 The Blue Train arrives at Howick for an off-the-train excursion at the Howick Falls. 16:00 The Blue Train departs from Lion’s River Station to Durban Station. 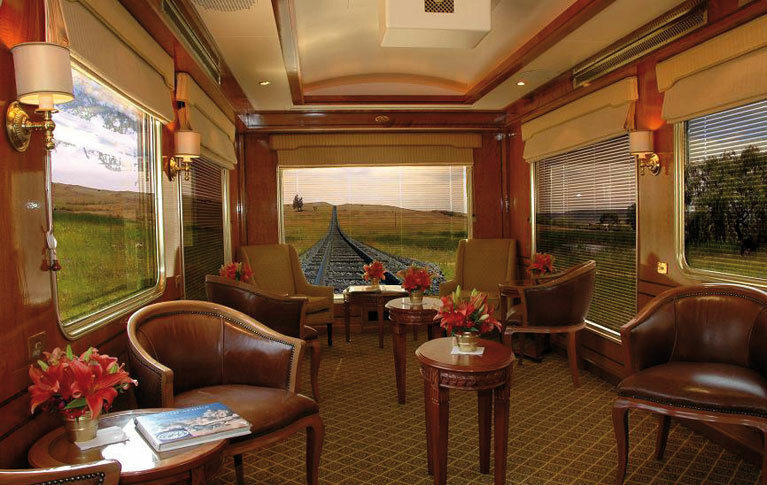 Guests will enjoy some leisure time & relaxation at one of our exquisite lounges on the train. 17:00 The Blue Train arrives at Durban Station and guests disembark. Port Elizabeth which is situated in the Eastern Cape is one of the oldest and largest cities in South Africa. Port Elizabeth is also known as “The Friendly City”. The Blue Train will depart on a five day tour from Cape Town and will meander along the stunning picturesque garden route. Day 1 10:00 Guests arrive at the Blue Train VIP lounge – Pretoria Station. 11:15 Welcoming and safety briefing and announcements are made – Train Manager. 11:30 Boarding commences. Butlers will usher guests to their suites. 12:00 The Blue Train departs from Cape Town to Port Elizabeth. 13:00 – 16:00 Lunch is served in the Dining Car. Guests will enjoy some relaxation & leisure time at any one of our exquisite lounges and are also welcome to refresh themselves prior to dinner. 19:00 – 23:00 Dinner is served in the Dining Car. 09:00 The Blue Train arrives at George station and guests disembark. GUESTS DISEMBARK TO ENJOY SIGHTSEEING/EXCURSIONS AROUND GEORGE AND WINE TASTING. THE BLUE TRAIN WILL BE STAGED IN GEORGE TRAIN STATION FOR GUESTS TO RETURN FROM THEIR OFF THE TRAIN EXCURSIONS. 17:00 Guests will be transferred back to George Station to board The Blue Train. 18:00 The Blue Train departs from George to Port Elizabeth. Guests are welcome to refresh themselves or enjoy pre-dinner drinks served at any one of our exquisite lounges. DAY 3 06:30 – 9:30 Breakfast is served in the Dining Car on a first come-first serve basis. 10:00 The Blue Train arrives in Port Elizabeth and Guests disembark. GUESTS DISEMBARK TO ENJOY PE SHORE EXCURSION AND CITY TOUR OR GUESTS CAN ENJOY ADDO ELEPHANT PARK FOR SOME GAME VIEWING. THE BLUE TRAIN WILL BE STAGED IN PORT ELIZABETH FOR GUESTS TO RETURN FROM THEIR OFF THE TRAIN EXCURSIONS. 17:00 Guests will be transferred back to Port Elizabeth to board The Blue Train. 18:00 The Blue Train departs from Port Elizabeth to Mossel Bay. DAY 4 06:30 09:30 Breakfast is served in the Dining Car on a first come-first serve basis. 10:00 The Blue Train arrives at Mossel Bay and guests disembark. GUESTS DISEMBARK TO ENJOY SIGHTSEEING/EXCURSIONS AROUND MOSSEL BAY. 17:00 Guests will be transferred back to Mossel Bay Station to board The Blue Train. 18:00 The Blue Train departs from Mossel Bay to Paarl. DAY 5 06:30 09:30 Breakfast is served in the Dining Car on a first come-first serve basis. GUESTS DISEMBARK TO ENJOY SIGHTSEEING/EXCURSIONS AROUND WINELANDS. 16:30 Guests will be transferred back to Paarl Station to board The Blue Train. 16:45 High Tea is served in the Lounge Car. 17:30 The Blue Train arrives at Cape Town Station and guests disembark. 17:00 The Blue Train arrives at Cape Town Station and guests disembark. GUESTS DISEMBARK TO VARIOUS ACCOMMODATION AROUND CAPE TOWN & TO STAY AT A HOTEL OF THEIR CHOICE. On the Southbound trip, the train departs from Pretoria Station at 8h30 and arrives in Cape Town at the Cape Town Station at 15h00 the following day. En-route to Cape Town there is a stop-over and an excursion in Kimberley, where we take a step back in time to the days of the diamond rush. On the Northbound journey, the train leaves Cape Town at 08h30 and arrives in Pretoria at the Pretoria Station at 15h00. The off-the-train excursion includes a stop at the Lord Milner Hotel in Matjiesfontein. On arrival at Matjiesfontein guests are invited for a glass of sherry at the bar. Day 1 06:30 Guests arrive at The Blue Train VIP Lounge – Pretoria Station. 07:00 Welcome and Safety briefing speeches are made – Train Manager. 07:30 Boarding commences. Butlers will usher the guests to The Blue Train and this might provide guests with an ideal photo opportunity. 08:30 The Blue Train departs Pretoria Station to Cape Town. Guests will gather in any one of our exquisite lounges for some leisure time or relaxation and to enjoy aperitifs. Hot Snacks will be served in the lounge car or observation car. 10:30 – 14:00 Brunch will be served in the Dining Car. 17:30 Guests arrive at the Open Mine Museum for a tour of the mine. 19:30 – 23:00 Dinner will be served in the Dining Car. After this exciting tour, guests are welcome to refresh themselves and enjoy pre-dinner drinks served at any one of our lounges. DAY 2 07:00 – 10:00 Breakfast is served in the dining Car on a first-come-first served basis. 15:00 The Blue Train arrives at Cape Town Station. Butlers usher guests to The Blue Train Lounge.